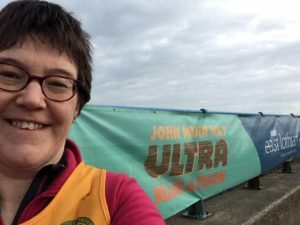 The John Muir Way Ultra is a 50km trail ultra along the final part of the John Muir Way, from Port Seton to Dunbar in East Lothian, Scotland. 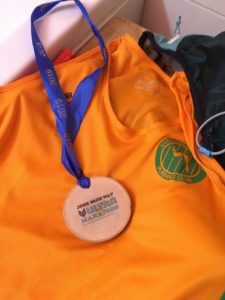 This was my first official ultra, although the two trail marathons I’d completed had been 29 miles and 27 miles, so I wasn’t too worried about the distance. However, there was a 7 hour cut-off time which DID worry me, as I’d finished a coastal marathon a month before in 6:38. 22 minutes for another 5k didn’t sound likely for me, so I was concerned. So, a little bit more speed work and a recce of the second half, and a good dose of “let’s just see what happens”, and I found myself at the start line. You could register at the finish near Dunbar and be bussed to the start, but as I live closer to the starting point I went for the extra half hour in bed and turned up at the start point directly. The registration here was well organised, and there were loads of portaloos, and as the buses from the finish hadn’t got there, zero queues for the toilets! A group photo was taken, then we were encouraged to sort ourselves in to three starting waves, and off we went! We followed the coastline east, beside (not on!) fabulous beaches and quiet paths. The first checkpoint at 8k came along quite quickly, but I was trying to not hang around, and with a water bladder full of Active Root, I went straight past. There were some ominous looking black clouds, and before too long it was time to decide whether the rain was actually worth stopping for, and putting on a waterproof. By this time there was no blue sky to be seen, so I gave in and paused to rearrange jackets, backpacks etc. I was glad that I had done so, as the rain just got heavier and heavier. The joys of running in glasses that are covered in raindrops with eyes that have salty rain water running painfully in to them! The next aid station came and went in the drizzle, and I was glad that the rain finally went off as we headed towards North Berwick. This was the half-way point, and the changeover for the relay runners who completed 25km each. As a final sting in the half-way tail, we ran over the sand for the last 500m before climbing up to the RNLI station which had food as well as jelly babies etc. More sand followed, which was dry and deep so I just walked through it, before we climbed out of North Berwick through a lovely wooded glen. At this point I knew where I was as I’d recce’d the second half of the route two weeks before – we went around North Berwick Law and headed south across East Lothian farmland. The John Muir Way was well signposted and we generally ran on well maintained wide, smooth paths on an undulating course. There were marshals at all the road crossings, who were invariably smiling and cheerful. A final stop in Smeaton at the marathon-distance point allowed me to refill my Active Root juice, grab some more pretzels and jelly babies, and then head on to the finish. We turned east again and ran beside the Tyne river (not the Northumberland one!) which was considerably lower than it had been two weeks before. We regained the coast where the paths became more technical which wasn’t ideal on tired legs. I knew this part well as I’d taken part in their nocturnal ultra back in December which followed this route, but it was great to see a VERY happy chirpy marshal who assured me that I only had 1.5km to go. It was great to see my husband waiting for me at the end, and I finished in 6:43, well inside the 7 hour cut off, and only 5 minutes slower than the 27mile trail marathon from 4 weeks before. I also took 20 minutes of my marathon PB time, so was very happy all round. I munched happily on cake and drank my husband’s coffee, then another cup, and then claimed my Tshirt, which I wanted to have to wear the next day in another 11 mile race! This was a very well organised event with the smile-iest marshals I’ve ever seen. Food and drink was plentiful, AND I got a medal at the end, all of which contrasted with my experiences at the Northumberland Coastal marathon in February (still waiting for my medal…..) The route was much nicer than I’d feared – I’d expected it to be more on road, but the paths were hard-packed so my decision to wear road shoes was the right one. Given the (lack of) elevation, this is probably a quick 50k route, and the East Lothian countryside was beautiful, so I’d definitely recommend this one.